Cinco de Mayo is less than a week away. We love Mexican food, and I'm always up for celebrating with fun libations, so it's definitely my kind of holiday. I have a few more ideas and recipes to share with you this week, but for now I'll go with the motto of "eat dessert first," and start with these cupcakes. How do you like your margarita? Frozen or on the rocks? Salt or no salt? I always order mine on the rocks, and like to mix it up with salt/no salt. My standard margarita is also a Texas-style. While in theory a strawberry margarita sounds like a great idea, the execution isn't usually all there, and it is usually cloyingly sweet with artificial strawberry flavor (side note: Try these if you want an awesome strawberry margarita). However, a strawberry margarita cupcake? I think the theory and execution are both pretty spot on here. Preheat the oven to 325 degrees and line two muffin pans with liners. Whisk together the flour, salt, and baking powder in a medium bowl, and set it aside. In the bowl of a stand mixer fitted with a paddle attachment, cream the butter and sugar at medium-high speed until light and fluffy, 3-4 minutes. Scrape down the sides of the bowl and add the eggs, one at a time, incorporating them fully before adding the next one(s). Whisk together the vanilla, lime juice, lime zest, buttermilk, and 2 tablespoons of the tequila. Starting and ending with the flour mixture, alternate adding the flour and the buttermilk mixture in 2-3 increments, with the mixer at low speed. Mix just until incorporated. Divide the batter among the muffin tins. Bake 18-24 minutes, or until a toothpick inserted into the center comes out with just a few crumbs attached, and the tops spring back with touched lightly. Remove the cupcakes from the oven and allow to cool 5 minutes. Brush the tops with the remaining 1/4 cup of tequila and allow to cool completely before frosting. Puree the strawberries in a food processor and set aside. Combine the egg whites, sugar, and salt in the bowl of a stand mixer set over a small pan of simmering water. Whisk constantly by hand until the sugar has dissolved (the mixture should feel completely smooth when rubbed between your fingertips). Attach the bowl to the stand mixer and fit with the whisk attachment. Starting on low speed and gradually increasing to medium-high speed, mix until stiff (but not dry) peaks form. Continue mixing until until the mixture is light, fluffy, glossy, and completely cool (test by touching the bottom of the mixing bowl), about 10 minutes. With the mixer on medium-low speed, add the butter 2 tablespoons at a time, mixing well between each addition. Scrape down the sides of the bowl, increase the speed to medium, and mix until the buttercream comes together (it can take up to several minutes, but it will come together eventually). Switch to the paddle attachement and beat at medium-low speed to remove air bubbles, about 2 minutes. Gradually add the strawberry puree, lime juice, and tequila, and mix to combine. 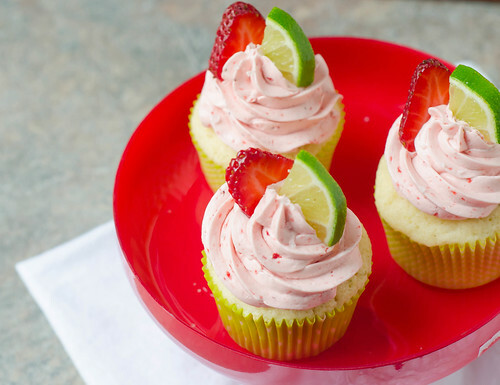 Frost cupcakes as desired, sprinkle with salt, and garnish with strawberry and lime slices before serving. I'm making vegan margarita cupcakes for a friend's bridal shower this weekend and this post is making me think I need to add strawberries into the mix...especially since the bride-to-be LOVES the color pink! Hmmm. Gorgeous! Can't wait to try these! I made your tequila-lime turkey chili again yesterday and it was a big hit. Everyone can eat it as it isn't too hot, and some don't eat red meat etc... Awesome. These look awesome Josie! Almost too pretty to eat...almost! It's going to be finish of mine day, however before finish I am reading this fantastic article to improve my knowledge. Now you're talking! These must make it onto my table! I can't get the cupcakes out of my head. Maybe I can justify them if I make gluten-free. :) Thanks for sharing; I put a link on my SeeKarenFollow post this week and pinned it too. This might sound stupid but can kids eat these? Caitlin, that would really just be a judgement call. When all is said and done, each cupcake only has a small amount of tequila, so it'd be up to you if you felt comfortable giving it to a child. For what it's worth, for my little ones, I set a few aside before brushing them with the tequila, then frosted them before adding the tequila to the frosting. Hope you enjoy!